Are Redirects Safe to Use in Google AdWords Ad URLs? 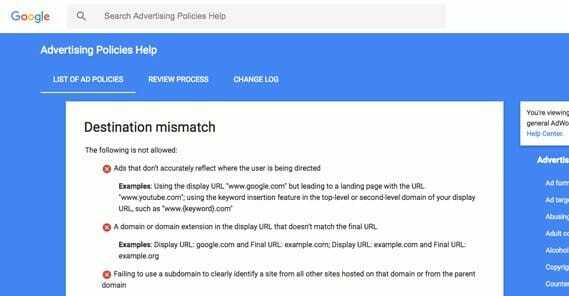 Blog > Resources > Are Redirects Safe to Use in Google AdWords Ad URLs? Google has a lot of advertising policies for their AdWords system. 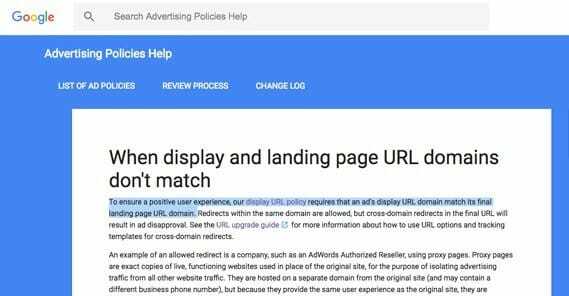 When you’re trying to buy traffic to a URL, you want to make sure they’re going to allow ads to work, which means you have to be in compliance with all of those various policies. Given that there are hundreds of individual policies, most reasonable business owners can’t be bothered to read and understand them all. Sure, you can hire out your ad management to someone who does, but that’s an added expense. You can just try to guess and roll with it, but that’s likely to end up with a lot of trial and error. The best option is to take what you know, take your intended ads, and ask questions about what might be missing between the two. One such element is whether or not redirects are allowed in Google ads. On the one hand, it seems like they wouldn’t be. Sending people to site B when they thought they were clicking on site A is pretty bad. It’s the kind of disjointed user experience that gets people suspended from ads programs. On the other hand, redirects are one of many ways people gather statistics or split test landing pages. It happens all the time, and a lot of people seem to get away with it, indicating that it’s probably alright. So which is it? So if the display URL on your ad is www.example.com, you’re able to send people to example.com/landingpage, or to example.com/landingpage2, but not anotherexample.com. The exception to this rule is if you’re an authorized reseller using a proxy domain. A proxy domain might be example.proxy.com. The key to this scenario is that the proxy version of the site and the real version of the site are functionally identical. They might have minor differences in information, such as contact information or sales points, but the overall design, information, and goal of the pages are the same. This is essentially what happens with split testing, among other things. Proxy domains have additional restrictions on them as well. For example, a proxy domain should be listed as noindex in your site meta data. 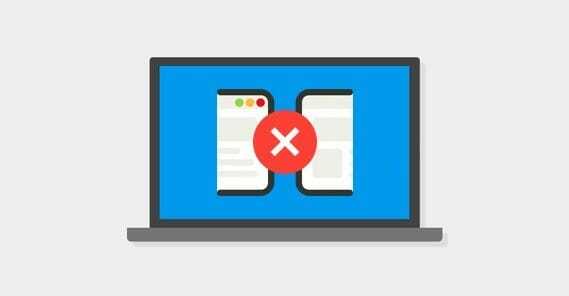 Because it’s an exact copy of your site as it stands, the proxy version should not be indexed in search results and should not appear in organic searches at any time. Additionally, the proxy URL and the regular domain URL cannot both have ads pointing to them at the same time. A proxy website is generally used to filter traffic and analyze specific captured data, not to be an indefinite landing page. There are actually a ton of requirements for the destination page for your ads on AdWords. They fall into a handful of specific categories. The first category is the destination experience. This only has two main points, but they cover a lot of ground. Destination pages or destination content cannot be unnecessarily difficult or frustrating to navigate. Excessive pop-ups, interstitials on every link, obfuscation, scripts that refresh the site when the back button is clicked, and forcing an app download to view a piece of content are all disallowed. Destination pages cannot be non-website pages. For example, if the user clicks a link and their browser tries to download a file, that is considered malicious. Likewise, having an ad that links directly to an email address or a file of any sort – even if that file is legitimately relevant – are bannable offenses. If you want to link directly to an ebook, you can’t do it. You need to create a landing page for that ebook, upon which the user can click a button to initiate a download for the ebook. Forcing a download directly is against the rules. The second category of destination rules has to do with the content, typically insufficient content. The destination page cannot have excessive advertising on it, specifically more ads than actual content. Google doesn’t want to send publisher traffic to pages that only exist to serve more ads. The less content you have and the moer ads you have, the worse off you’ll be. The recent Google Fred update addresses this proportion as well. The destination page cannot have content that is primarily copied from another source without adding value to it in some way. Mirroring sites, scraping content, pregenerated or template websites and other such duplications are not allowed in the ads system. You also can’t get around this by modifying publication dates; Google uses the indexation date as a primary source for comparing two pages with duplicate content. The destination page can’t be designed solely to send users to yet another page, like a redirect that requires the user click to get the redirect. Doorway pages, gateway pages, things like the Forbes welcome interstitial, these cannot be destination links for ads. You can use them in organic marketing, though there are generally better options, but they’re not for advertising. The destination page can’t be a parked domain. If you want to sell a domain name you own, you need to find some other way of advertising the fact that the domain is for sale. The destination page can’t be entirely blank, incomprehensible, or nonsensical. This tends to exclude some of the more exotic art projects out there, but also randomly generated spam and blank pages. The third category are issues with destination mismatching. This is where the redirect rules come up, and other related issues. You cannot make ads that don’t accurately reflect the destination. For example, if you made an ad that looked like the site was pointing at YouTube, but the site was actually your own site, you can be hit with the mistmatch. You cannot make the display URL and the final URL different. It doesn’t matter what the initial landing URL is, or how many redirects the user passes through, so long as the final destination is where you say it is. I would of course caution you against using excessive redirects, for many reasons, but if you need one you can use it without penalty. If you’re using a domain on a multi-site domain that has multiple clients, you can’t use the main domain as your display URL. For example, if you were advertising a particular blog on WordPress.com, you would need to make sure your display URL is blogname.wordpress.com rather than just WordPress.com. The only time this is required is if multiple companies can use the domain; in cases where you own the domain and everything on it, you’re free to just use the root domain. 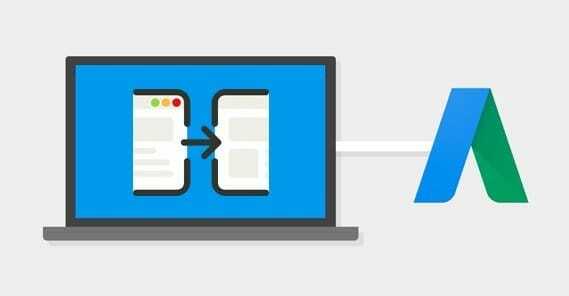 You might run into issues using tracking templates for a type of page that doesn’t match the type of page you’re using as your destination page. For example, if you use the tracking template for a specific product page but your ad leads to a product category page with many products, the mismatch can come back to bite you. And, of course, the whole deal up at the top about redirects. You can redirect, but you need to make sure the final destination matches the display URL. There are also restrictions for what can happen if your destination page does not work properly or at all. Any time the destination is not crawlable by AdWords spiders, your ad will be denied. This can sometimes cause issues with portal pages or with proxy pages, occasionally. Any time your destination page returns an HTTP error, like 403 forbidden or 404 not found, the ad will be denied. You can’t run ads to sites that don’t work, after all. It does no one any good. You cannot run ads that use an IP address rather than a URL as the display URL. IP addresses technically work for that purpose, but they aren’t useful information to the people clicking on the ads, so Google prefers if you don’t try to mess with them. You can’t use URLs that use invalid characters, which include most special characters. Anything that makes the ad not work, or prefaces a parameter like #, won’t be allowable. Additionally, there are rules about phone numbers that you might want to use with your ads. It generally only matters for call-only ads, so if you’re not using those, don’t worry about them. You can’t run an ad to a phone number that hasn’t been verified by Google. For obvious reasons, they want to make sure they aren’t telling users to call some random house phone or the phone of an unrelated business, a scam line, or a pay-per-minute charge line. You can’t run an ad to a phone number that is inaccurate, irrelevant to the ad itself, unrelated to the target company, or that is inactive. Google will place test calls occasionally to make sure any phone numbers used in ads are still valid and haven’t changed hands. You can’t run an ad to a phone number that charges people, like a 900 number. Even if you disclose this to the people seeing the ad, many will miss the disclosure and it will come back to bite you. Some shared cost phone numbers are allowable, but will be flagged to notify the user before they call. You can’t run an ad to a vanity phone number. Using letters in place of numbers makes it a vanity number and thus unavailable. You can’t run an ad to a fax number. It just doesn’t work and won’t do anything to help anyone. You can’t run an ad to a phone number that is not local to your region. For example, if you’re an American company, you can’t use a German phone number. You can’t run an ad to a phone number that does not have an active, effective voice mail service. Google wants any customer who calls to be able to leave their message or place their order, what ever their purpose is, they need to be able to connect to something. And, of course, anything that violates any of the other AdWords policies. I wasn’t kidding when I said there were a lot; this page just shows you a list of various categories of ad policies. What I’ve summarized above is just one of those categories. At the end of the day, when it comes down to URL redirects, you’re free to use them so long as the end result – the page the user finally comes to rest – is the page you’re telling them they’ll end up on when they click the ad. This is the kind of transparency Google wants out of their advertisers. There are other reasons why you might not want to use more than one redirect. For example, if it slows down loading the page by an appreciable margin, many people won’t want to wait and will close out the tab. People are pretty picky with what they’ll click and with how long they’ll wait to get it. Moral of the story is, just because you can, doesn’t mean you should. Still, one redirect should be fine, so long as you don’t try to hide it. Is Buying Website Traffic Safe for Google AdSense?